I am on to a new project involving scraps of course! I love scrap quilts and I save scraps religiously. I found this pattern, called Trellis, on Etsy here. The pattern is by Karen Griska so check out her site. She has some great patterns. I did alter this a bit. The pattern calls for using 1 3/4 strips but I seem to have an abundance of 2 1/2 strips so I reworked the block with those strips. The original block ends up at 6 inches finished. but the reworked one is 8 finished. Here's a block in the bottom left of the picture below. I have no idea what size quilt I'll end up with but I'll decide along the way. 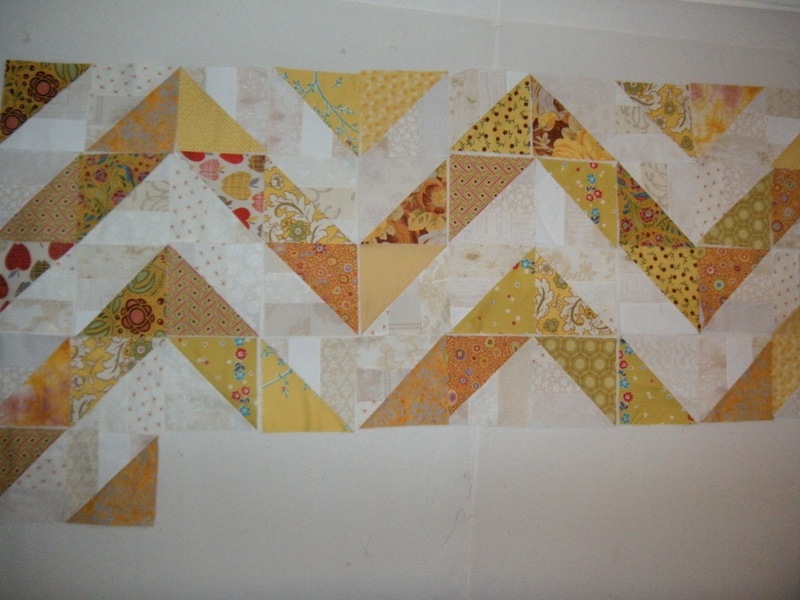 This is a fun block to make! Other than that, winter hangs on here but spring is trying to show up. It may be in the 50's this weekend which will feel like a heatwave in these parts! I hope the first day of Spring does not look like this at your house. This is part of my backyard. It has snowed and snowed this winter and we are supposed to get more according to the weatherman. I really want to get a hold of that ground hog. So to take my mind off winter I have been doing some sprucing up around here. I finally turned my son's old bedroom into a guest bedroom. Very simple with cream colored walls as it is a very small room. I love gallery walls and decided to create a couple in my home. I am a collector of anything framed and I had a lot hanging around so I had fun gathering and deciding what would go where. Pinterest is loaded with inspiration, by the way. And there is my Scrappy Trip quilt all done. It's perfect in here. This one is in my family room. That watercolor in the center has been in my family forever. My Dad got it somewhere and there are pictures of me as a child with that in the background and I am turning 60 this year so it has some age to it. The painted tray was a wedding gift to my MIL in 1946. The lighthouse is a paint by number that my FIL did in the 60's when he was ill with Lou Gehrig's disease. He passed away in 1965. It's fun to gather mementos like these in one place. I think that's why I like gallery walls so much. And here is a wall I did in our little lake house. Again made mostly with old family photos from both my husband's and my family. I have also been gathering ideas for my next sewing project and I think it is going to be this. 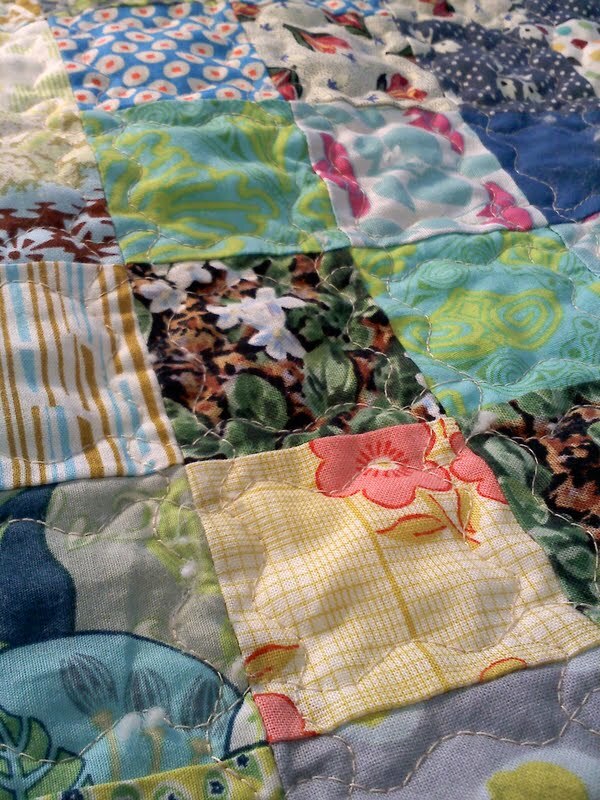 I adore scraps quilts and and I still have lots of scraps. You would think making scrap quilts would get rid of the scraps but they seem to multiply! My Scrappy Trip quilt is all quilted and ready for binding! I loved making this quilt and will definitely be making it again. And I quilted it myself! I used the Bernina #4 stitch that I have seeing other bloggers use and I think it gives it a nice old fashioned look. There's been a lot going on here most of which involves lots of snow so here's hoping the groundhog wasn't lying! I am really sick of winter. Well, we survived the blizzard. We only got 22 inches where I am in NH. 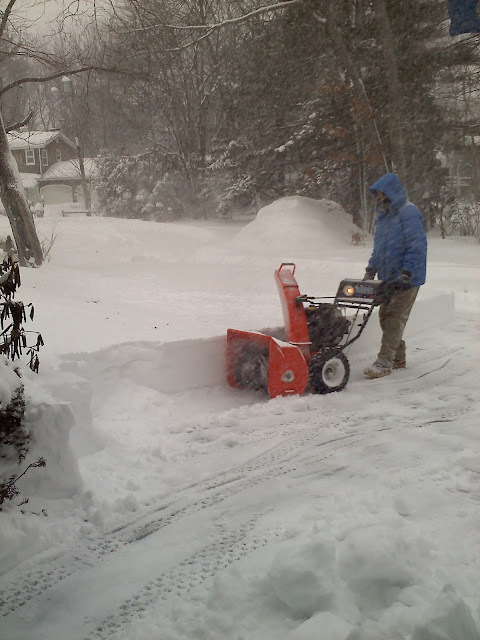 The roads are all clear a few hours after the snow stopped-we know how to handle a snow storm in NH. It does look very pretty outside but I am hoping spring comes early. I did get some sewing done today since we didn't lose our power but that's a post for another day. Stay warm. It's cold here-really, really cold and windy. I don't think it got above 10 degrees here. My kitchen is 61 degrees. The wood stove and central heating are not keeping up. So I put on my electric space heater and did some sewing. 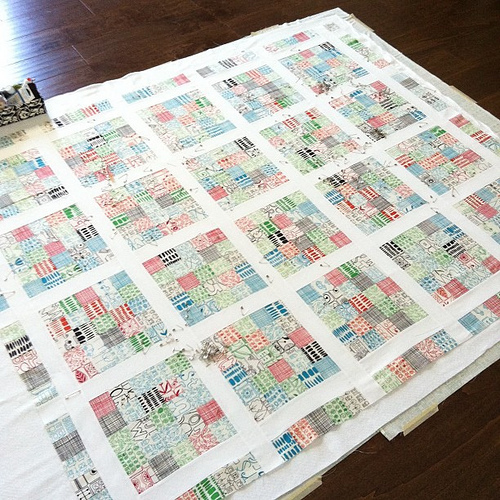 This is what 12 blocks looks like in my Scrappy Trip Along quilt. This is lots of fun to make because there's not much thinking involved in it. Just grab 6 strips and sew them together and go from there. Don't think too much about the colors or how the strips look together-just jump in and let the fabric do the work. I think that's why I like scrap quilts so much. They are saying 4 or 5 more days of these temperatures so I guess me and my space heater and my sewing machine will become good friends. Hope you are all staying warm. Well, almost finished! 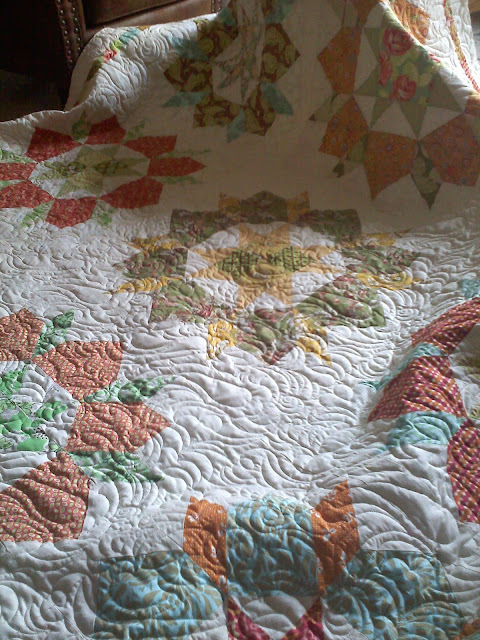 I just have to sew down the binding but this is my first finish of 2013 even though I started it in 2012. This was fun to make and easy-just half square triangles. I did make the cream part of the triangles a bit more interesting by using up a pile of 2 1/2 inch strips left over from a previous project and sewing them together and "making" some new fabric. I think it gives this quilt more texture and interest. Yesterday was a snowy day here so I was not going anywhere so after deciding resistance was futile, I cut up many strips, all from scraps, and have joined in on the Scrappy Trip Along. I have loved seeing all the quilts people are making and after seeing Monica's post I decided it was time to join. 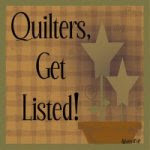 I love scrap quilts and I need to reduce the scraps I have so I am in. Monica's looks more planned than mine but I love all the solids she is using. I may have to add some in to mine. So who else has jumped in the Scrappy Trip Along pool? I hope everyone has a wonderful and healthy 2013 full of blessings. We had a simple New Year's Eve babysitting our 2 grandsons and to bed early for both grandsons and grandparents. We were subjected to the Wii game Lego Batman and neither myself or my husband could figure out how to play this game. The 3 and 5 year old knew what we they were doing and tried explaining it to their clueless grandparents to no avail. 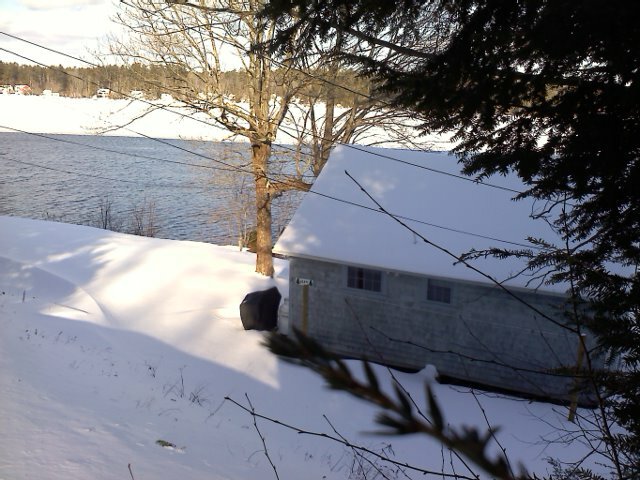 We wandered up to our lake camp today to check on it and it was beautiful. We had no snow for Christmas but had a couple of good snow storms since. We were kind of surprised to find open water still in front of our property so no ice skating yet. 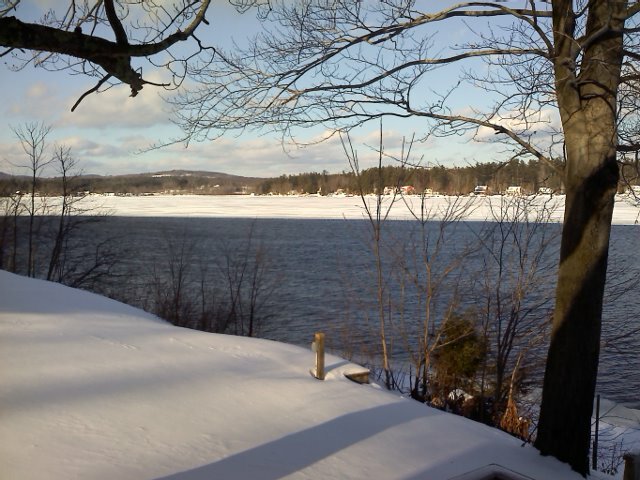 The other side of the lake looks frozen. And here I am shivering-it was really cold today. I can't wait until summer! Well, my last blog post was entitled Happy Thanksgiving so I guess it has been a while. I have spent the last 5 weeks enjoying friends and family, loving my Christmas decorating, finishing up some gifts and just taking in the season so it was time well spent. I hope everyone has a blessed and happy Christmas. See you in the New Year! 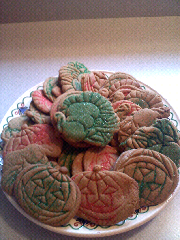 Grandson Carter helped Nana make cookies today since he had no school. He was in charge of Pumpkins and did a great job with the cookie cutter and I did turkeys which were a little tempermental. He did all the sugar. He was a little heavy handed once in a while but they sure are good! My daughter posted the following on her facebook and I thought it was worth sharing. I want to thank Thelma of Cupcake and Daisies who had a giveaway recently and I won! I won a layer cake-and even better it was any layer cake that I wanted. It was so hard to decide but I chose Summersville. When this first came out I kept seeing wonderful quilts that used this line but I never bought it. I love the simple graphic quality of the prints and I know I will be using this in something fabulous soon. 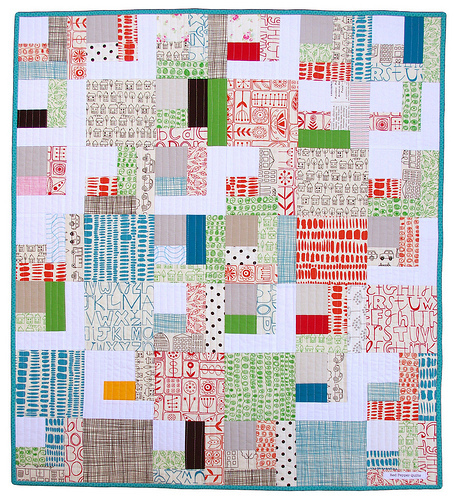 Here is one of the quilts I love by Red Pepper Quilts. I love the solids with this and the simple log cabin blocks. How about this one by Camille Roskelley. Again, a simple setting with spectacular results. So thanks Thelma and if you are not a follower of Thelma, you should be. 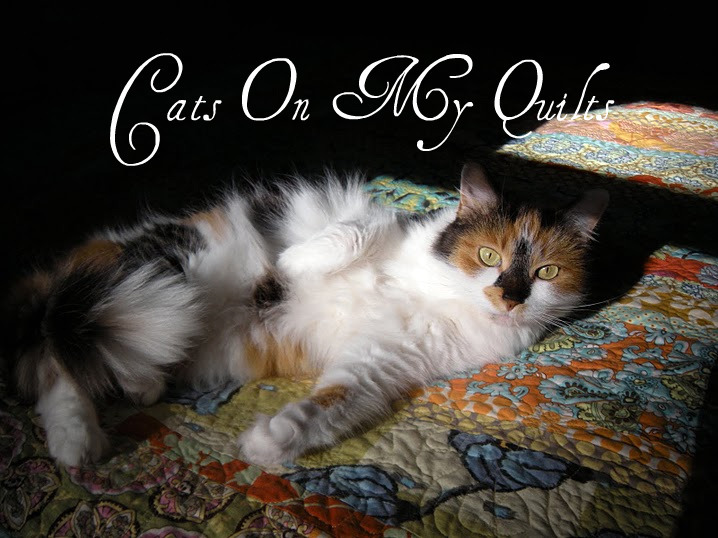 She is a very gifted quilter. I especially love how she can take a commercial pattern and make it her own. 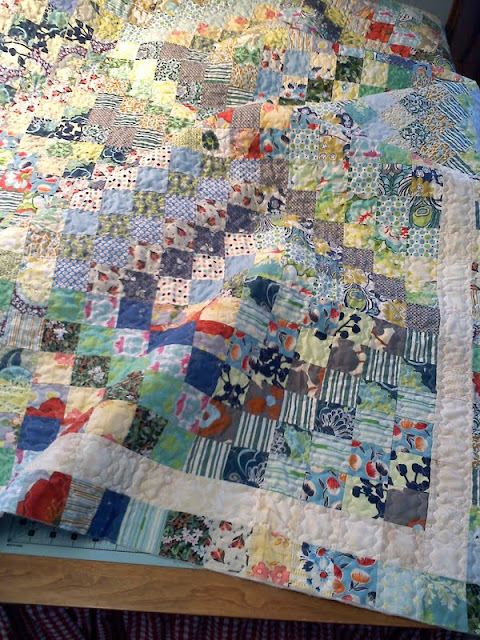 She takes a lot of care putting her quilts together and it shows in her spectacular quilts. So go visit! Well there's been much going on including superstorm Sandy. 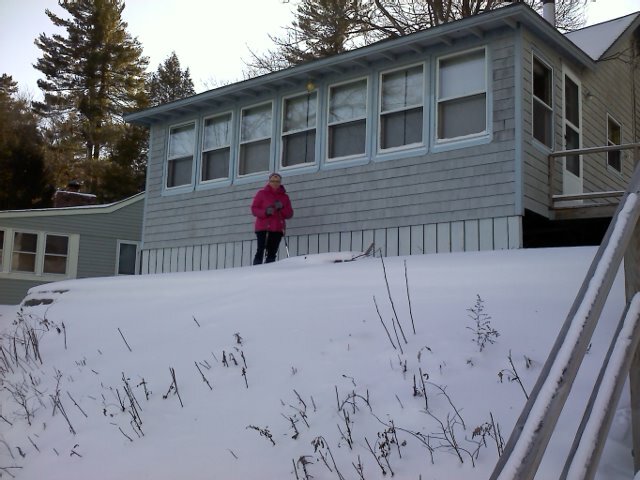 We fared well here at our home although others in NH did not but nothing compared to those south of us, including my brother in law in CT who just got his power back yesterday. One casualty has been my internet which has not allowed me to blog or do much of anything else on the computer. Comcast says it is a result of the storm and they are working on it-yada yada yada. This morning seems to be a window of opportunity to blog so here I go. I have had this stocking pattern by Camille Roskelley for a couple of years I think since it first came out. Each Christmas I think about making it but never seem to get around to it. 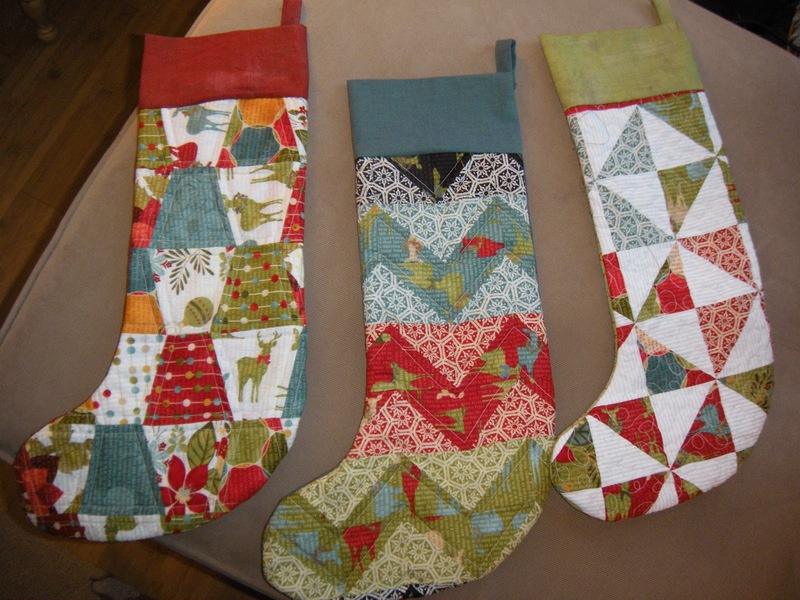 Then I saw Lisa's completed stockings and I got inspired and got to it. I am lucky enough to have 3 fireplaces in my house so extra stockings are fun to have at each one so I am all set for Santa. 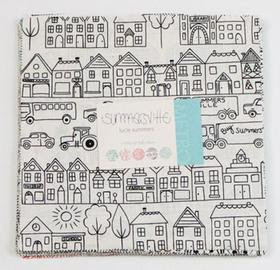 The fabric is Basic Grey Jovial-a Christmas line from last year. I also started working on this chevron quilt. I had a lot of yellows and a lot of neutral strips so this is a work in progress. I have finished my Swoon quilt and I love it. I used leftovers of favorite fabrics and colors and it went together beautifully. This is a fabulous pattern. I did make one minor adjustment to make it a little bigger to make it queen bed friendly. I added a one inch border made up of random sizes of scraps from the fabrics in the quilt, and finished it off with a second two inch border of the background fabric. The original pattern calls for just the first two inch border to be the ending point. It is back from my quilter, the binding has been sewed to the front so all that needs to be done is hand sewing the binding to the back. With a queen size that will take me a bit. So I better get a good movie or two and get stitching. After the success of my last chair project, I was ready to try another. I found this chair at my local antique store for $22. I was in need of a lot of glue to put it back together and some TLC. And that is my Swoon quilt in the background which is now finished! I'll show that soon. So I got out the Annie Sloan paint I had in the Old White color and got painting. I used the clear wax followed by the dark wax which really brought out the details on this wonderful chair. So that's what's happening here. Now that Swoon is done I have no idea what will be next but I have many quilts and projects I want to make so time to decide and have some more fun.